Another Fortnite cash-in, or a sign that BR can outgrow its fad status? Respawn Entertainment has released a battle royale game. That’s hardly likely to astound even gaming’s most casual observers. 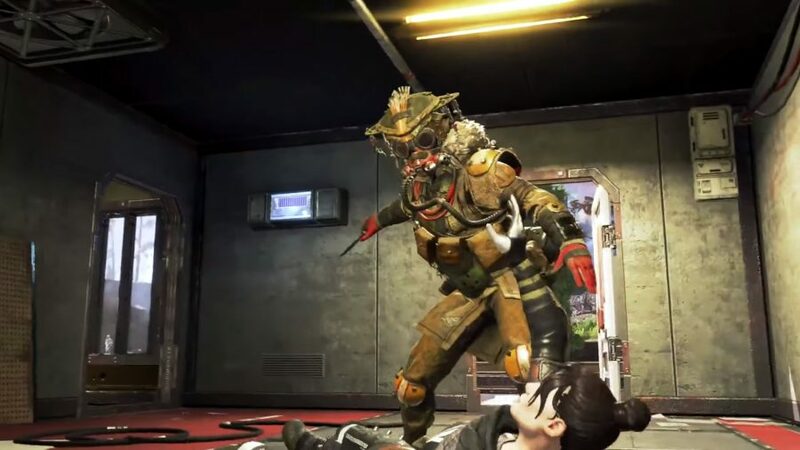 For one, the sudden ‘surprise’ launch of Apex Legends yesterday was pre-empted by a number of leaks. But more than that, it can feel like anyone and everyone who can string pixels together is making a battle royale game these days. Fortnite certainly has a lot to answer for. However, the arrival of Apex Legends – which is set in Respawn’s well-liked Titanfall universe – does beg a question. When does a game design craze become a genre? Consider that the term open-world used to be synonymous with a game design gold rush, but now is simply a framework numerous worthy titles can adopt. Judging by the tone of the Apex Legends launch stream, it’s clear Respawn feels it is serving a genre over a trend. Of course they’d say that. But the rise of battle royale, the team asserts, has offered an opportunity to deliver on a long-considered expansion of the Titanfall universe, a chance to refine an emerging genre, and a means to bring some diversity to the form. And why not? If battle royale only has the capacity for a handful of similar games, us players will never get to enjoy the variety we do in – say – the driving genre, where Mario Kart 8 and Forza Horizon 4 happily rub shoulders. Those games bring two very different flavours, but neither reinvents their wheels. At a fundamental level, the free-to-play Apex Legends is highly conventional. A scrum of players drop into a map, scramble for weapons and equipment, and do battle in a shrinking area that pushes the conflict to a crescendo. It is fast, it is fun; but is it just Fortnite in Titanfall’s clothing? This is a live game in which anything could change, but for now there are certainly a few distinct features. For one, Apex Legends is a squad-based shooter. There is no support at all for solo play, and the squad set-up appears to be the foundation around which everything else has been designed . A match sees 20 squads of three enter the battlefield, meaning 60 players total. What’s more, Respawn’s latest borrows explicitly from the hero shooter space. The titular Legends are the playable characters, each bringing different attributes and abilities that serve unique roles in any squad. There are eight included to start, two of which will need unlocking. Together they cover a range of familiar unit classes such as medic, skirmish specialist, defense tank, and so on. Apex Legends, then, is the battle royale game where you choose your character based on ability, and collaborate on the battlefield. Perhaps the standout feature is one that serves the cooperative nature of fighting in a squad. With a tap of the middle mouse button, the Legends can ‘ping’ items, highlighting the likes of map locations, weapon pick-ups, and enemies. Without a word, you can quickly and easily spotlight points of interest. It’s a simple system, but it keeps communication clear and functional without interfering with the main gameplay flow and pacing. It might sound like a small thing, but it’s hugely important: a squad-based battle royale needs to let teammates coordinate their efforts if it is to succeed in its prime distinctive feature. The ping system seems to have what’s needed to let that happen, to the point you can arguably forget about live chat. There’s a smart respawn system. Considering Apex Legends’ studio name, there had to be. You can also grab the dog tags off fallen teammates, and rush with them to a sometimes-distant respawn point. There you’ll have to sacrifice your own movement and weapon use for a few moments to bring back your peer. It’s a well-balanced dynamic that can lead to exciting twists of fate, as a team on the way out returns from the brink to reshape the match from a new location. Apex Legends is set 30 years after the events of Titanfall 2, in an area called The Outlands, where those displaced by the Frontier War have found a home. To settle disputes over resources, the Apex Games bloodsport has been established, and they happen to take a battle royale format. That’s why we really play battle royale games, after all. Each match may be framed by consistent systems and structure, but every one tells a different story; a drama of luck, misfortune, comebacks, and the turning tides of combat. The Titanfall setting also brings something vaguely distinct. 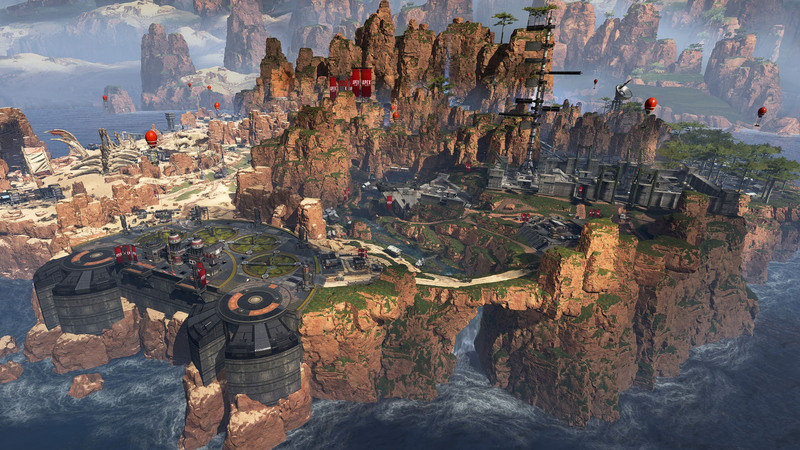 Before many even had a chance to see their download of Apex Legends complete, there was a quiet uproar about its lack of Titans, wall runs and double jumps; elements considered central to the series. Respawn has said that its new game just turned out to be a lesser creation with those features included. The team experimented, even dabbling with triple-jumps. But if removing mechanics crucial to the core Titanfall games means Apex Legends is more fun in a battle royale context, it’s a deviation from canon well worth making. 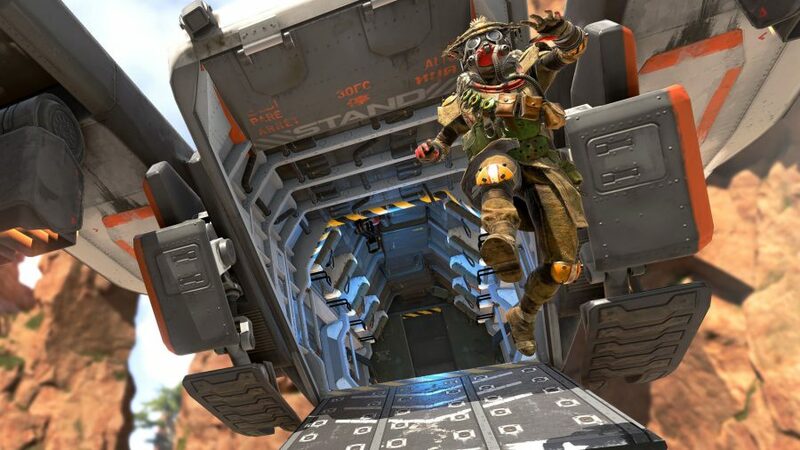 What Apex Legends does borrow from Titanfall more directly is gameplay fluidity. Here we have a shooter that is fast and flows brilliantly. There are quiet moments, and all the space needed to be stealthy or play as a sniper. But elsewhere, rapid movement speeds and a zippy slide ability evoke a sense of Titanfall games past. Then there’s the map layout. 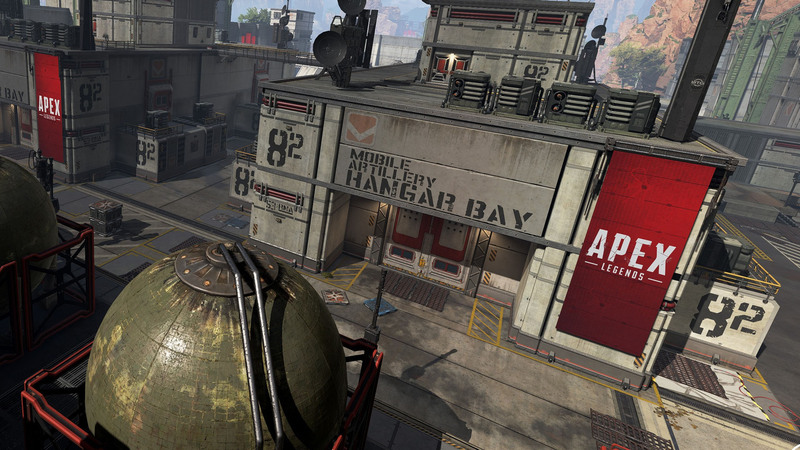 It’s too early to speak about every nuance of Apex Legend’s island setting, but what it borrows from the two Titanfall games is an impressive thoughtfulness about how every area – even each object – is positioned relative to those around it. If it were a skate park it would be reasonable to talk about the intelligence of its ‘lines’; considered paths between the ramps that make the entire map function as a single entity rather than a collection of distinct obstacles. That kind of design is present in Apex Legends, and it brings about a pace that is distinctly Titanfall. The Legends themselves take stylistic cues from the cartoonish excess of Overwatch, but sit well within the subtler Titanfall world. Each brings a trio of powers that match their class, from passive advantages to special and ultimate abilities. I spent most of my opening time with combat medic Lifeline, who is passively shielded while reviving teammates, can distribute a healing drone to support troubled squaddies, and can release an ultimate that calls in a pod of resources, which is as great for distracting enemies as it is stocking up on goodies yourself. The Legends and their gear can be decorated with all kinds of skins and superficial embellishments, which can be unlocked through gameplay, or bought with real-world money. Here Apex Legends dances to the tune of convention. Behind all the deals, in-game currencies, item shop, and forthcoming options like battle passes and seasons, it boils down to only paying for cosmetic items – many of which can equally be earned through gameplay. At launch there are, however, two playable characters locked away. Gas poison expert Caustic and holographic decoy specialist Mirage can either be bought outright, or secured by spending Legend Tokens, which are earned through play. We will have to see how that goes down. Apex Legends isn’t without its shortcomings. For now the spread of weapons feels a little too generic, and there are such a dizzying array of extra items to find on the battlefield – not always explicitly obvious in the distinctiveness they offer – it can be easy to simply ignore them. When you’re pinned down by three rival squads, choosing between one of three similar weapon scopes can be a decision it’s easier not to make. Perhaps that’s really at the heart of Apex Legends. This is a battle royale that isn’t obvious, immediate, or simplified. To understand it will take a good few games. But taking that journey? That might lead you through a genre example that brings a little more depth and reward to the form. It’s going to take weeks of play and potential content tweaks before we know if Apex Legends has what it takes to find a footing and bring lasting contributions to this new genre. And even if it does reveal itself to be one of the best, that doesn’t guarantee its ascendency to Fortnite levels of popularity. For now, though, it stands as a fantastically fun squad-based battle royale game, and that’s not a bad offering for free.